Other Dimensions: Seat depth measures 22 inches from back to front. Floor clearance measures 8 inches. Strokes of metallic color and hints of sparkling shimmers. Product Description Metallic Wonder. Jazz up your living space with the Limelight accent chair. This beautiful piece features warm brushstrokes of metallic gray and gold colors, and dark, slender legs that elongate the frame of this showstopper. 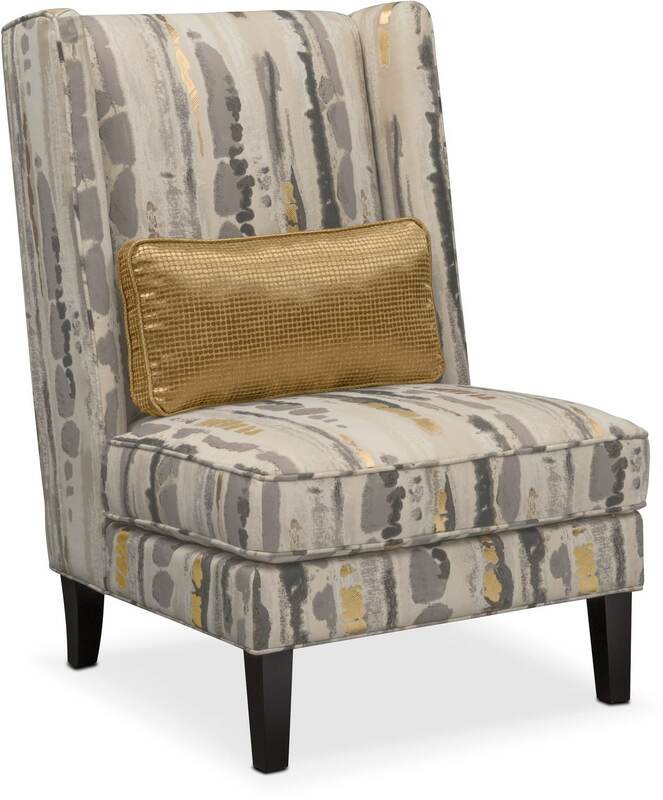 Fiber-wrapped, high-density foam core seating ensures maximum comfort, while a metallic accent pillow adds an extra pop of flair - sure to make this chair the masterpiece in any living space. Customer assembly required. Unique Features: Slightly curved back legs add a touch of grace and femininity, while elongating the frame. High-density foam core seating ensures maximum comfort. Features warm grays and golds that will light up a room. Construction: Hardwood and plywood frame construction ensures durability. Cushions: Fiber-wrapped, high-density foam core cushion ensures comfort. Springs: 4-gauge, sinuous wire seat springs prevent sagging and offer additional support.